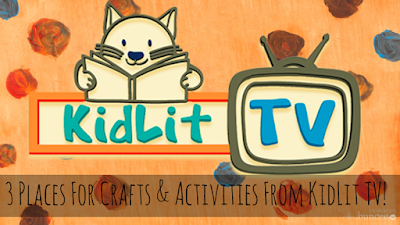 3 Places For Crafts and Activities From KidLit TV! I love finding new creative places to send students and teachers to as they connect to their creativity through crafts and activities. 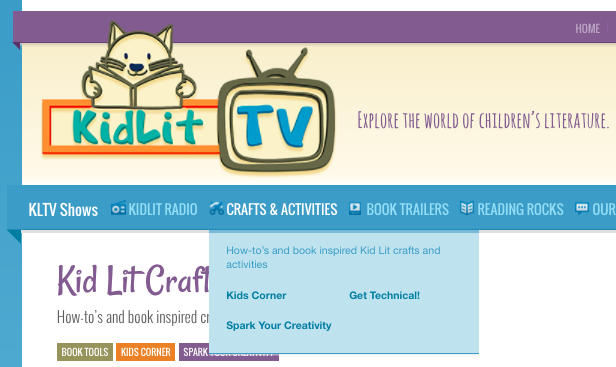 On the KidLitTV site, I have found three creative places and I can't wait to share them with you! Under Crafts and Activities on the KidLit TV website, you will find three places for crafts and activities. Technology which includes video technology tools to share with your students. As you can see, the sky is the limit for creativity, collaboration and connecting. And KitLitTV has done a terrific job at bringing them all together. 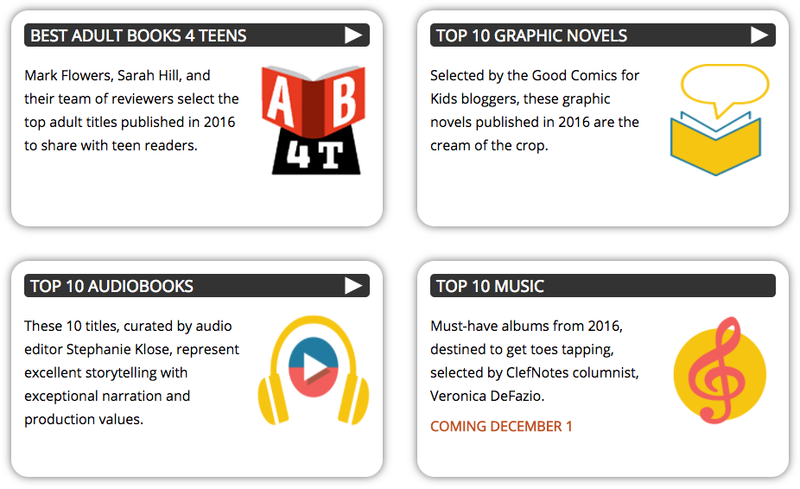 Best of 2016 Books, Apps and More From School Library Journal! As a teacher librarian, mom and reader, when the best books of year are announced by various people and organizations, I get so excited! 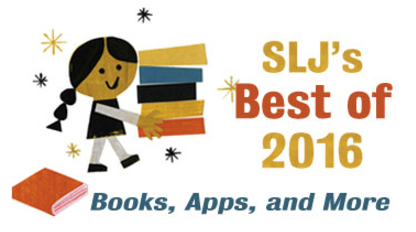 A few weeks ago my amazing friends at School Library Journal started to announce their lists for the best books, apps and more for 2016. In all, 66 books were selected by the review editors as the very best. 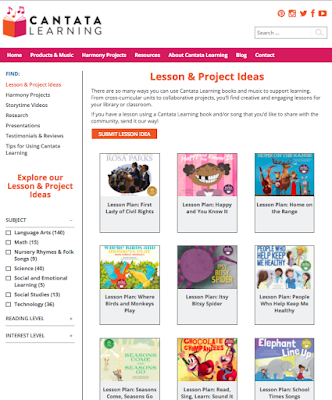 These titles are organized in several different categories including Picture Books, Chapter Books, Middle Grade, Young Adult, and Nonfiction. You will find this list here. 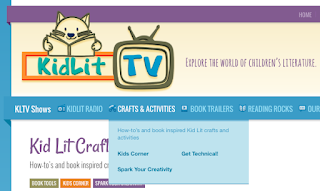 You can also join KidLit TV Live for School Library Journal Best of 2016 Books, Apps and More above for the recording of this wonderful event. 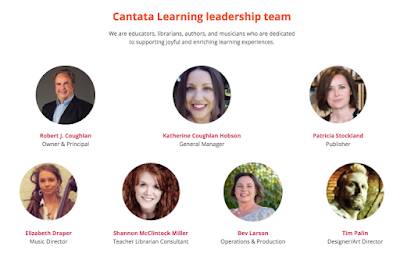 Also, you will love the lists below as they include all of the various resources we lift up as teacher librarians and educators to our students and school community throughout the year. These are located on the SLJ's Best of 2016 list here too! As you can see several have been announced, but there are some to go too! Tomorrow they will reveal Top 10 Music and throughout the week and next, four more will be revealed including Top 10 Latinix Books, Top 10 Apps, Top 10 Tech and Top 10 DVD's. 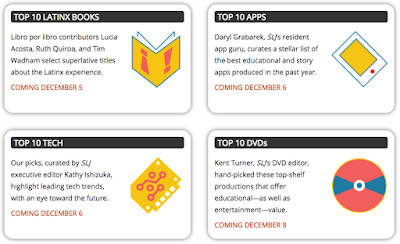 Personally, I can't wait for the Top 10 Apps from my friend Daryl Grabarek and Top 10 Tech from my friend Kathy Ishizuka. Thank you to everyone at School Library Journal to bringing us such a special gift as we end another year of amazing books, apps and more! 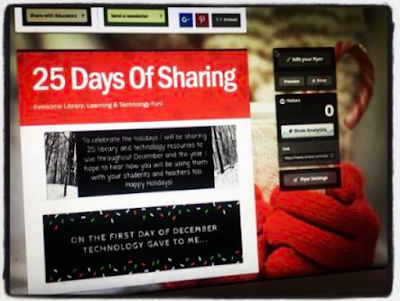 One More Day Until We Kick Off....25 Days Of Sharing, Creating and Fun! The holiday season is my favorite times of the year. I love all of the sharing, giving and caring that takes place. It is the perfect time of year to also share with our students, teachers, parents and community. 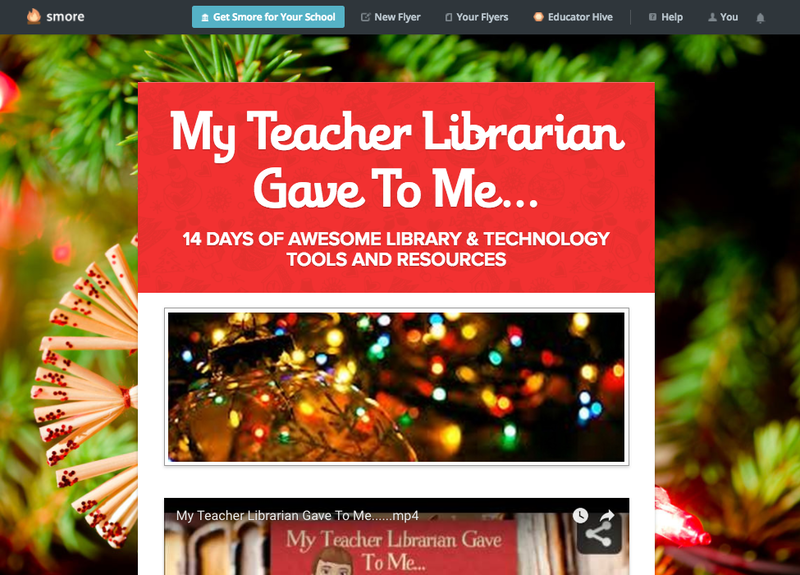 My Teacher Librarian Gave To Me....14 Days Of Awesome Library and Technology Tools and Resources. It was a great success as everyone loved learning about something new each one of these days. You can view this Smore here. 25 Days Of Sharing, Creating and Fun project. We will post the link to our Smore tomorrow on December 1 and a new one everyday until Christmas. 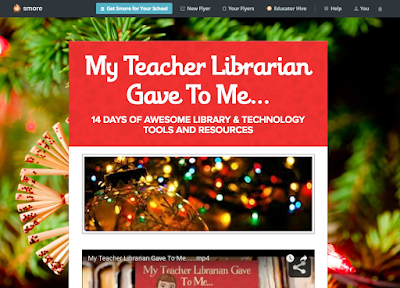 It will be a great way to learn and try out 25 awesome library and technology resources for you and your students. Please, feel free to share this with your own students, teachers and school community. It is another wonderful way to keep the enthusiasm for learning and creating happening all year long! 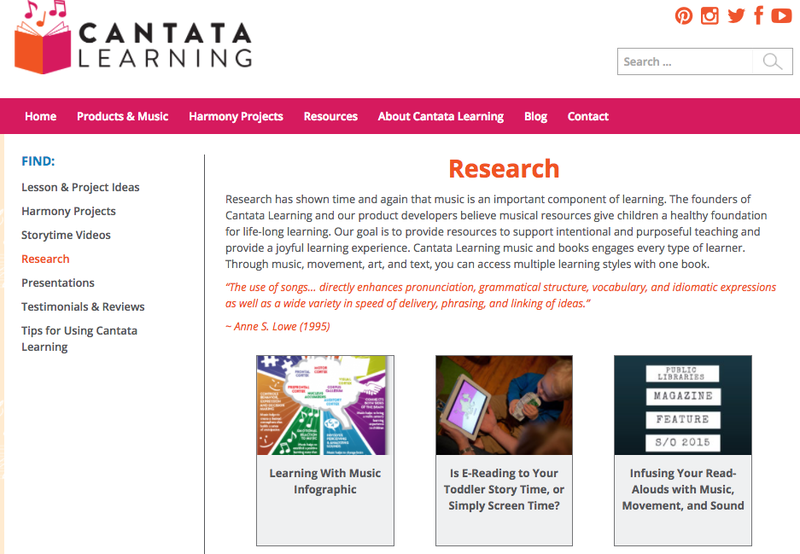 12 Things You Won't Want To Miss On The NEW Cantata Learning Website! 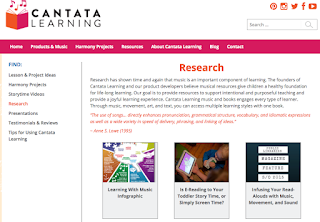 Cantata Learning has a beautiful new website! I couldn't wait to share this with all of you. 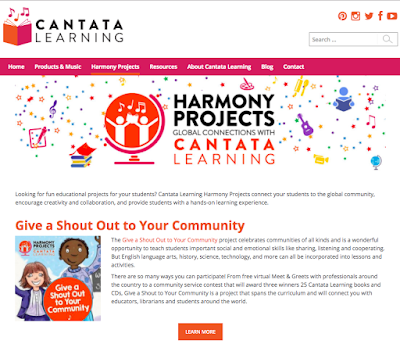 Not only is it interactive, engaging and fun....It is filled with music, stories, resources and information for your library, classroom and all of the children you work with at school and home. 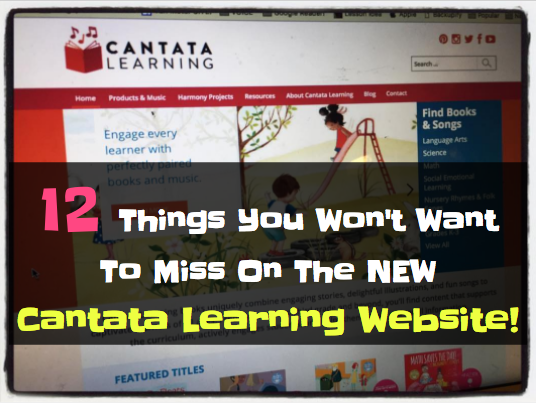 In fact, here are 10 things you definitely won't want to miss on the new Cantata Learning website. 1. You will find all of the Cantata Learning books and songs on the home page! 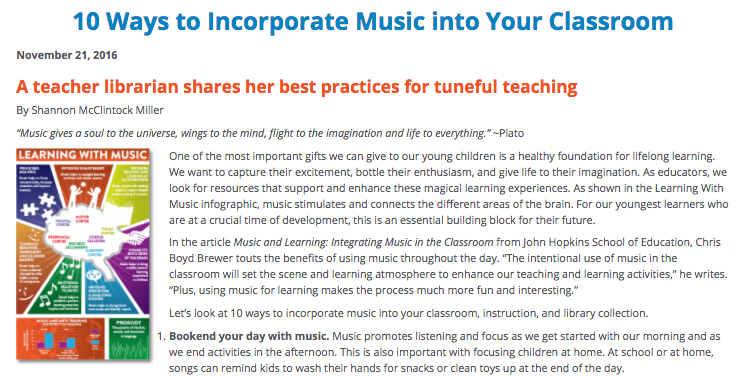 There are songs to enhance every aspect of your curriculum. They are organized into the different subjects which makes it easy to find and play them. 2. All of the songs are free to stream or download. You will find this on the page for each title. You can even stream or download just the instrumental version. 3. 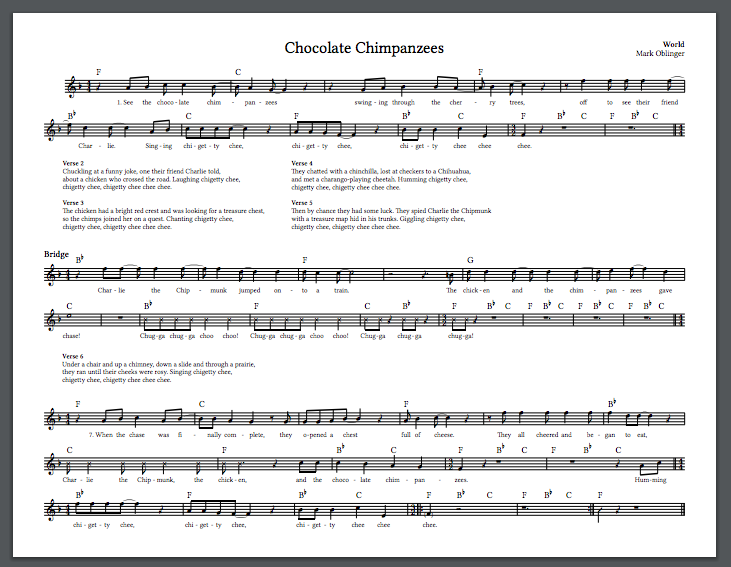 The sheet music is also available to download. You will also find that on the page for each title. 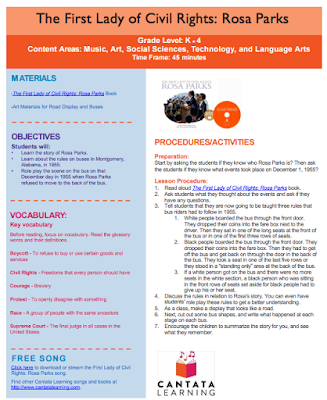 You can print this off or use it with an overhead projector or device. 4. You can browse the catalog for all of the books and music. You can even explore the Cantata Learning products by selecting subjects, genre, reading and interest level, series and music genre. 5. 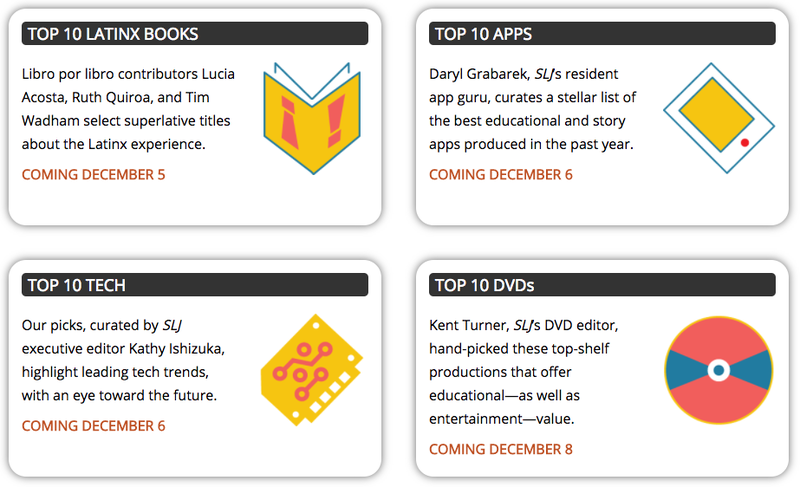 On the home page, there is a carousel of Featured Titles. I love seeing the new ones that pop up on here. To view a title all you have to do is click on that cover. 6. Also on the home page you will find Storytime Videos, Cantata Learning stories being read by me! 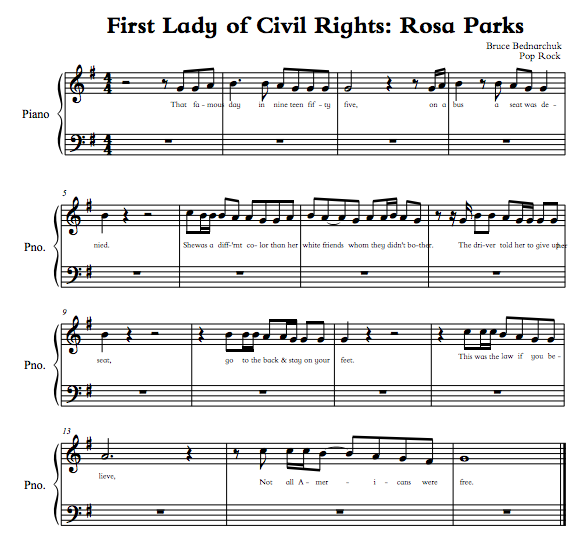 These are fun to play for your students as a class or even in a small group. And just think how much individual students will love watching these at school and home. 7. 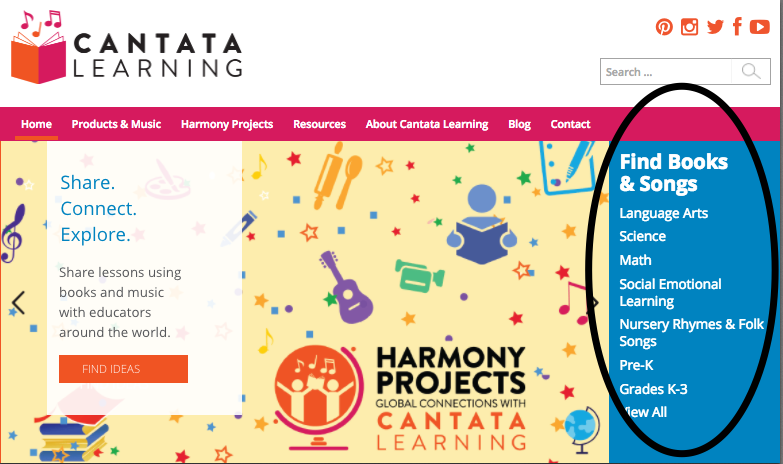 You will find the Cantata Learning Harmony Projects from the link at the tool bar on the top. 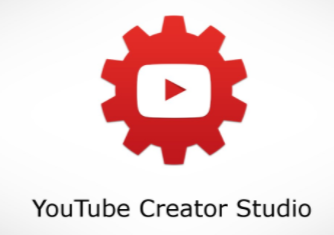 It will show you all three of the projects and even the individual school projects too. 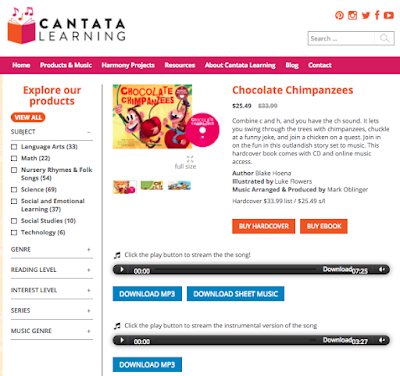 This is a great place to get ideas for using Cantata Learning stories and songs in your own library and classroom too. 8. 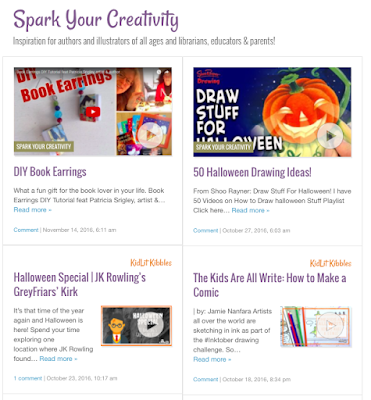 Under Resources, you will find lots of new ideas and inspiration. One of my favorite places to go under Resources is to several rich lesson plans that we have developed for the Cantata Learning stories and songs. 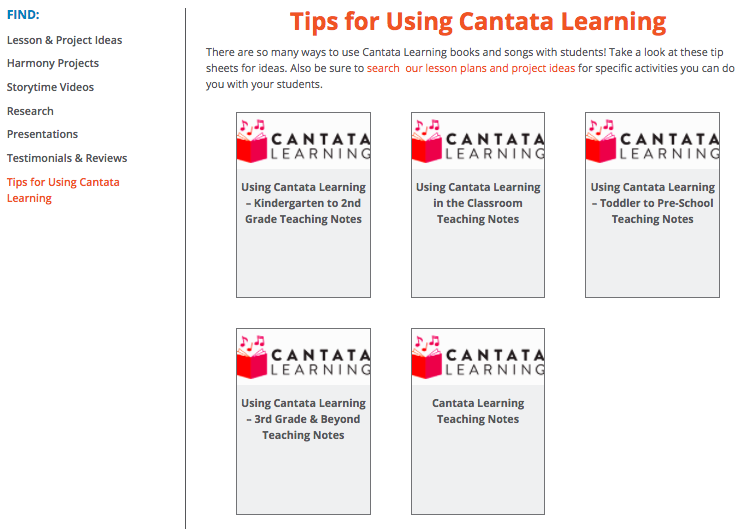 You will also find these under Lesson and Project Ideas. 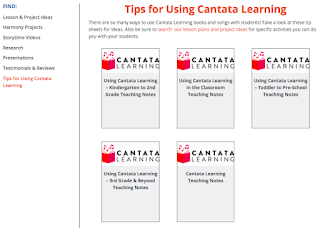 Tips for Using Cantata Learning. 10. 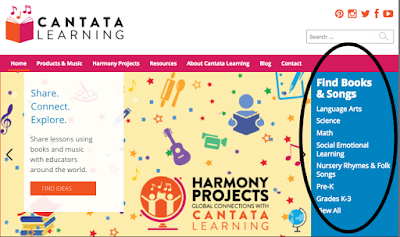 On the Cantata Learning Blog, this is where you will find posts with news, events and presentations. 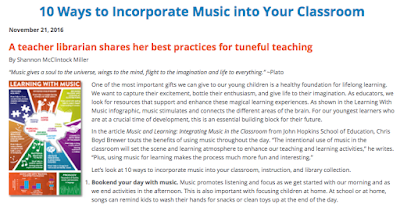 For example, last week we posted a new article I wrote A Teacher Librarian Shares Her Best Practices for Tuneful Teaching for Edvocate. 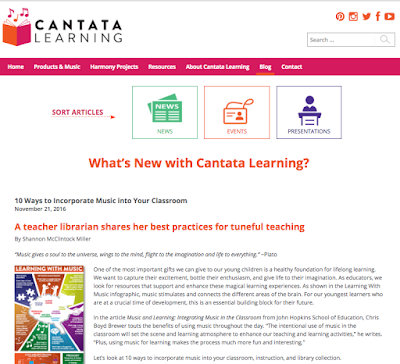 We posted it on the Cantata Learning blog too. 11. Under About Cantata Learning, you will find the amazing infographic created Learning With Music and all of the information you need to show how to use the stories and songs to help students build skills and meet standards. 12. The last thing I wanted to point out is the Cantata Learning Leadership Team, which I am very proud to be part of! I am the Teacher Librarian Consultant. 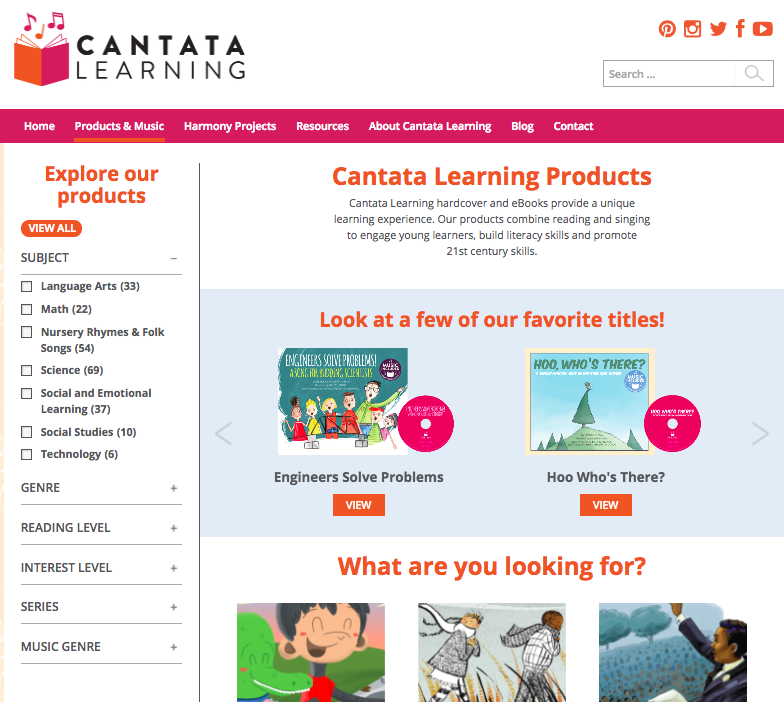 You will find all of us under the About Cantata Learning page too! 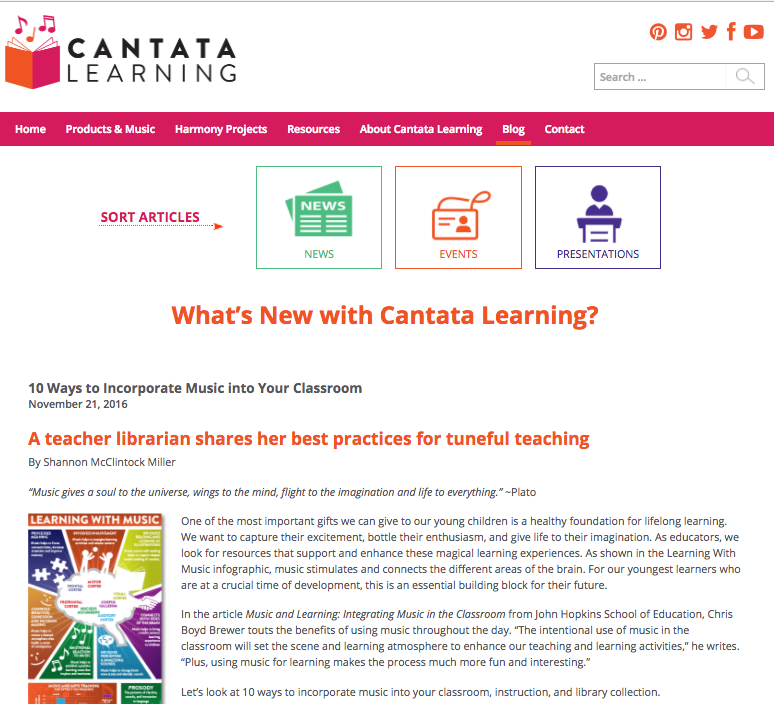 I hope you enjoy these 12 reasons and even more on the new Cantata Learning site! I find something new every time I visit and love the way it supports us in using all of the songs, stories and other fabulous resources we are creating for our young learners. 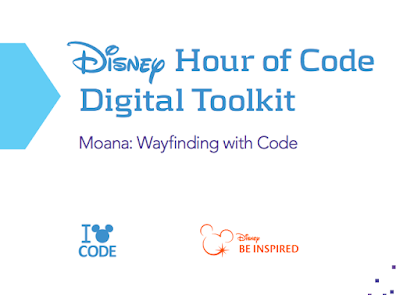 Learn To Code With Disney & 4 Of Our Favorite Movies! As we get ready for Hour of Code in just a few days on December 5-11, we are all looking for the best resources, activities and events to hook our students and get them interested in coding. 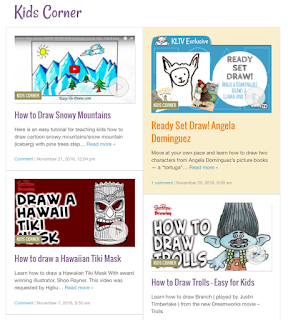 Well, just look at what Disney has created for all of us to use with Hour of Code this year! 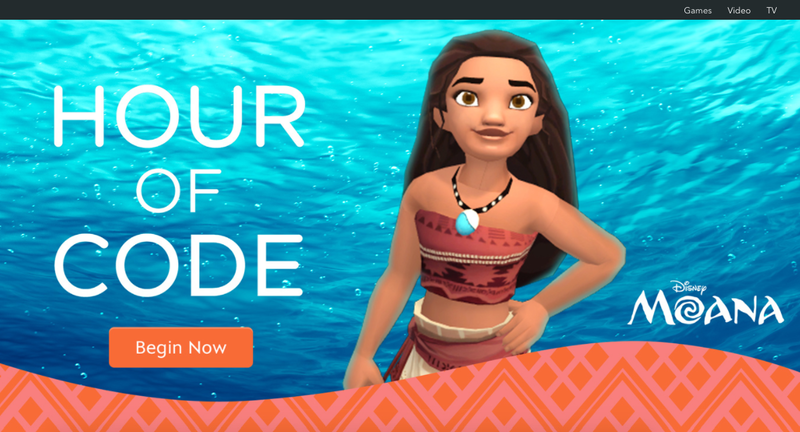 Our students can learn how to code with the newest Disney characters from Moana through the amazing partnership Disney has with Code.org. They will love heading into Moana's world as they work through 19 lessons as they learn how to code. 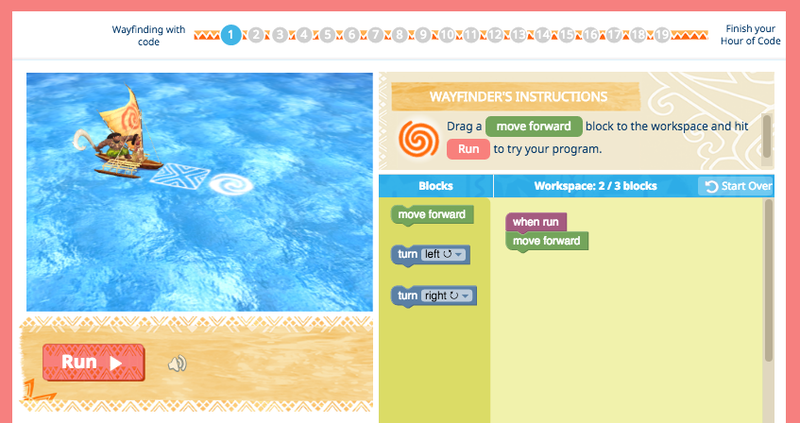 The story of the “Moana: Wayfinding with Code” tutorial centers around Moana and Maui as they sail through unknown territory across the ocean. 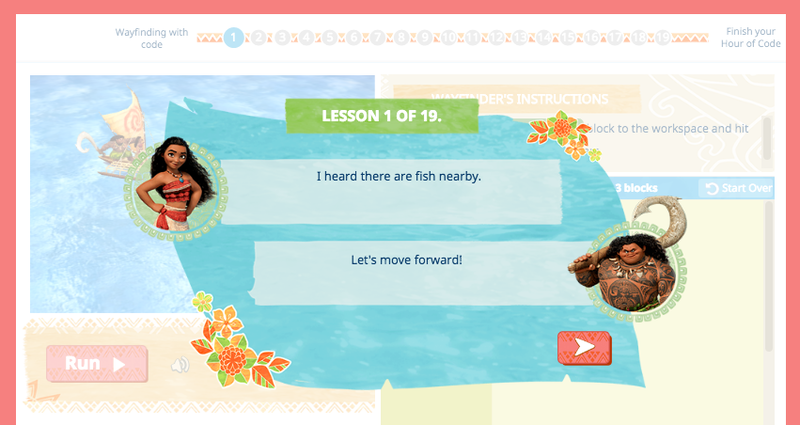 As students follow Moana and Maui’s travels, they learn basic coding commands that help steer the boat. Along the way, students are introduced to conditionals, sequences and loops while they master the art of navigation. When Moana and Maui are suddenly attacked by the Kakamora – coconut-clad warriors—they must use their coding skills to dodge their pirate projectiles and penetrate their defenses. 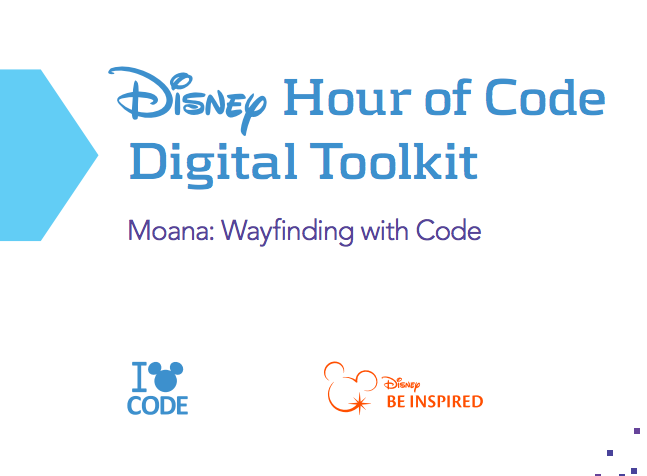 The “Moana: Wayfinding with Code” tutorial is available in more than 180 countries and 23 languages, including Samoan Polynesian. Thank you to Disney for helping us give children all over the world the opportunity to learn the basics of coding. all of the Disney coding lessons created over the last several years are still available on their coding site here. 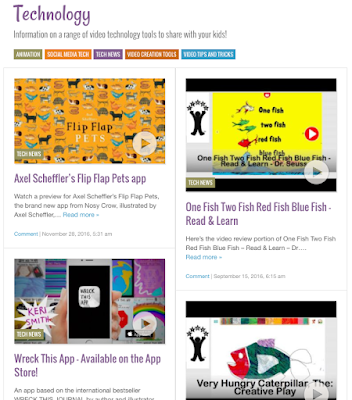 Also on the Disney Hour of Code site, you will find several videos perfect to share with students, teachers, parents and your school community. 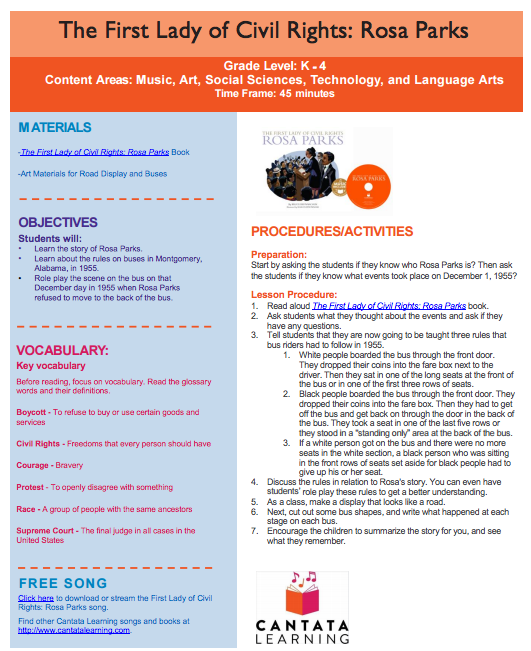 There is the Hour of Code Toolkit, which is a wonderful place to layout your entire Hour of Code event. 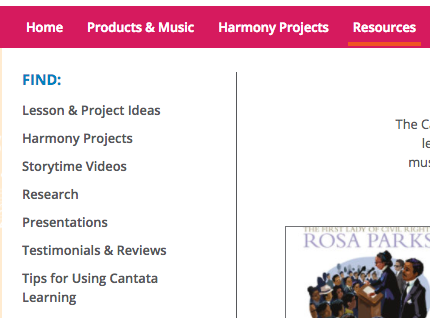 They have included everything you need including extensive directions, supports, resources and even reproducibles for the special event. 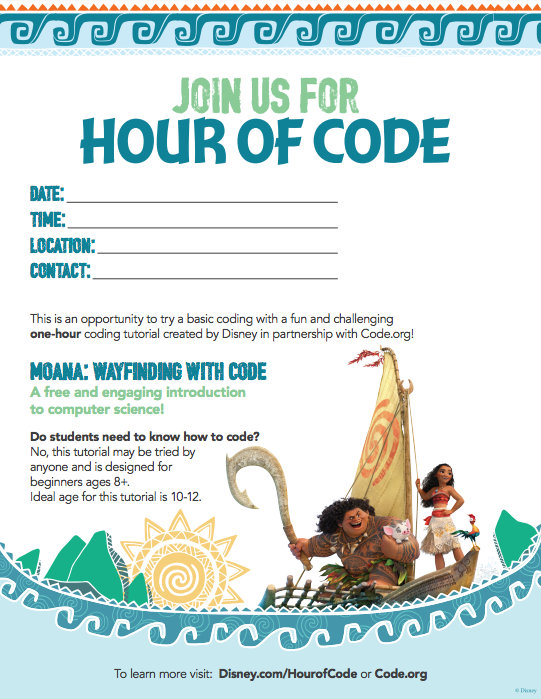 I love this poster and flyer inviting everyone to Join Hour of Code! You can register your Disney Hour of Code Event here from the website and also find these materials on Code.org too. 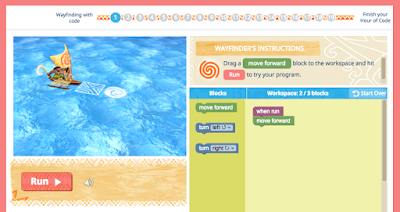 Have fun.....I can't wait to see how your students learn to code with a little help from Disney! 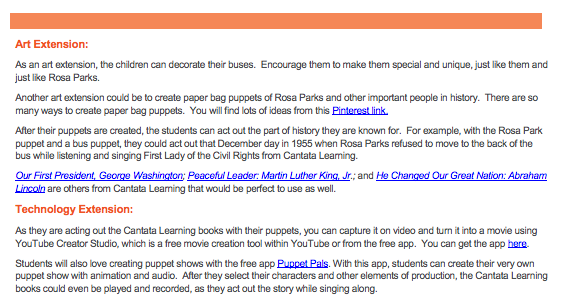 4 Special People In History Through Stories, Songs and Creative Paper & Digital Puppet Activities and Cantata Learning! 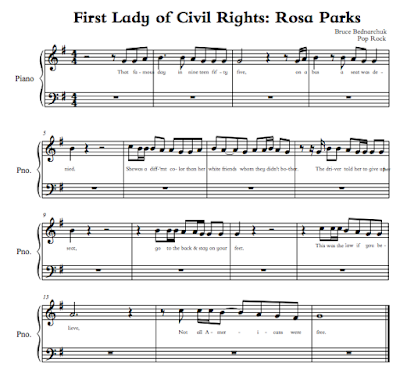 What a special way to teach your students about one of the most important women in history.....with a beautifully illustrated story and song. Especially this week as we get ready to celebrate Rosa Park Day on December 1st! Rosa Parks became the model for others to learn and follow. She gave hope to all who wanted to be free. 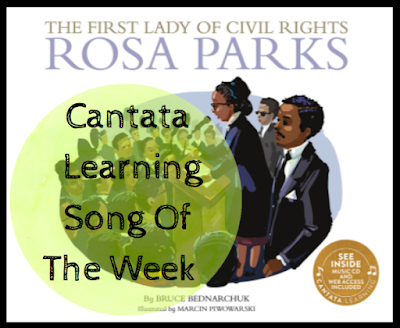 You will find The First Lady of Civil Rights Rosa Parks on the Cantata Learning site where you can stream or download the song here. 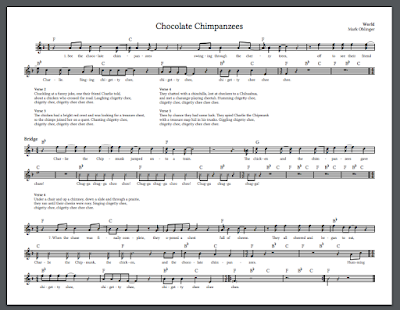 And something new with the brand new website....You can download all of the sheet music for each book. I love thinking of all the ways we can use this with our students in the library, classroom and even as a home connection as a family. First Lady of Civil Rights. 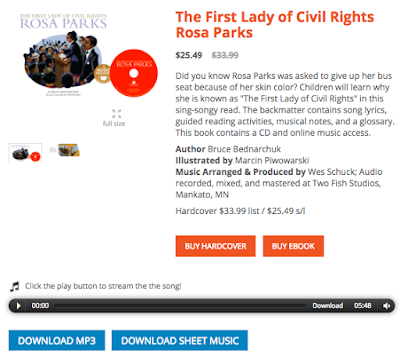 One art extension that would be super meaningful and fun with this book is to create paper bag puppets of Rosa Parks and other important people in history. There are many ways to create paper bag puppets. 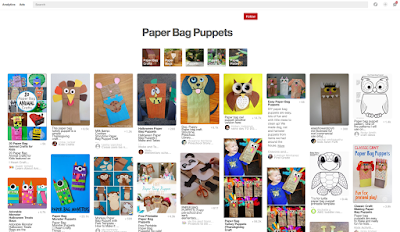 You will find lots of ideas from this Pinterest Board, Paper Bag Puppets. After their puppets are created, the students can act out the part of history they are known for. 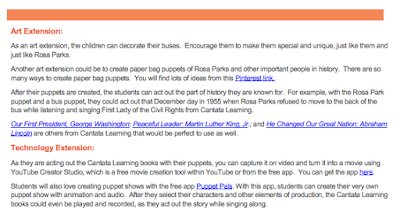 For example, with the Rosa Park puppet and a bus puppet, they could act out that December day in 1955 when Rosa Parks refused to move to the back of the bus while listening and singing First Lady of the Civil Rights from Cantata Learning. 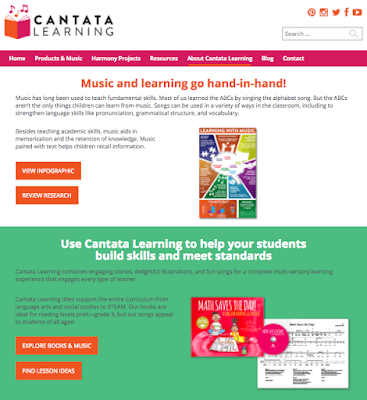 As they are acting out the Cantata Learning books with their puppets, you can capture it on video and turn it into a movie using YouTube Creator Studio, which is a free movie creation tool within YouTube or from the free app. 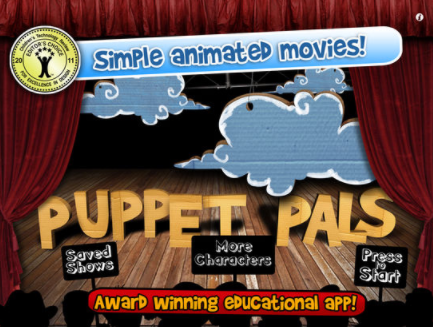 Students will also love creating puppet shows with the free app Puppet Pals. With this app, students can create their very own puppet show with animation and audio. After they select their characters and other elements of production, the Cantata Learning books could even be played and recorded, as they act out the story while singing along. 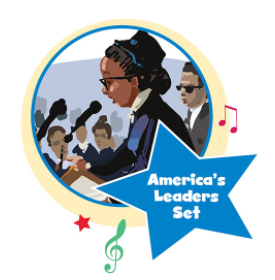 Our First President, George Washington; Peaceful Leader: Martin Luther King, Jr.; and He Changed Our Great Nation: Abraham Lincoln are others from Cantata Learning that would be perfect to use as well. These are part of the America's Leaders Set which can be found here. 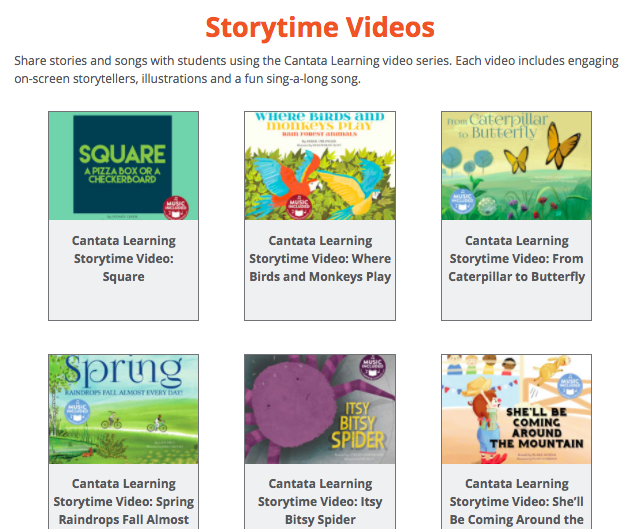 You can order this beautiful set of books and songs from Capstone here. Your students will love learning about these four special people in history through stories, songs and creative paper and digital puppet activities too! 25 Digital Generators To Spice Up Your Projects! 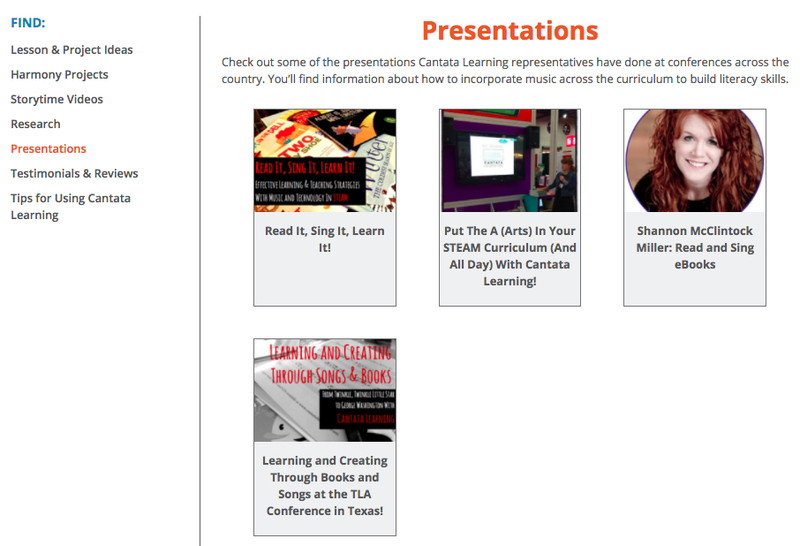 You SPARK Connections As Teacher Librarians! Coding. Coding. Coding. Pinterest Board! Two Coding Games & A Whole Lot More On ABCya.com! Coding With LEGO....Bits & Bricks! 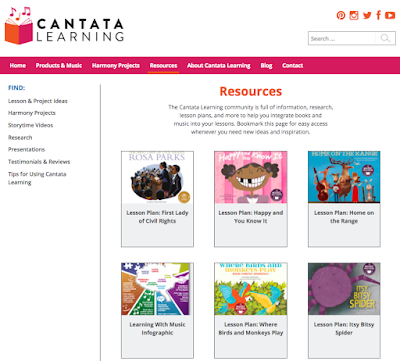 Let's Get Moving With Cantata Learning!